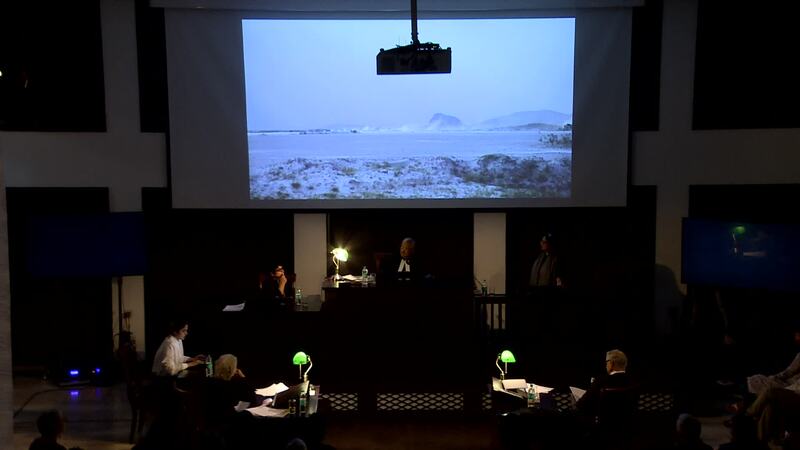 Can art be provided as judicial evidence in court trials? 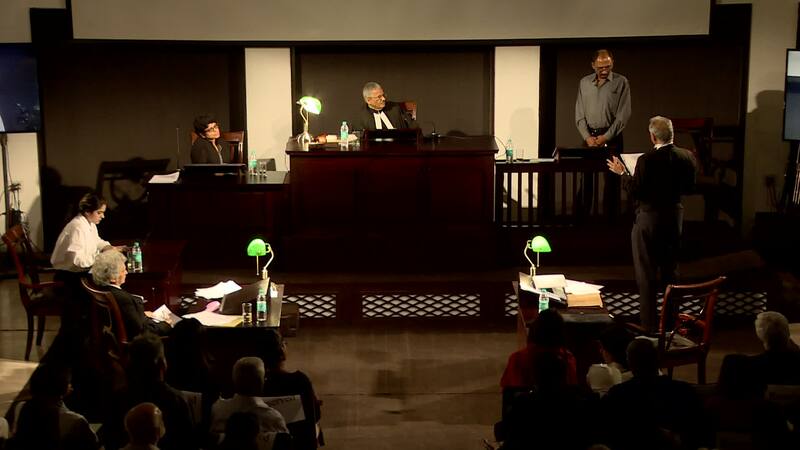 The KHOJ international Artists Association and Zuleikha Chaudhari staged a mock trial with artists presenting evidences and lawyers arguing for and against the case of art as judicial evidence. This mock trial was staged at the constitution Club in Delhi on 9 April 2017. The setting emulated a real court and the actors are professionals in their respective fields. Two lawyers, Norma Alvares and Anand Grover, raised the pros and cons of utilizing artist narratives in court rooms. The mock trial was heard by Justice Yatindra Singh, a judge and former chief justice of the Chattisgargh High Court. Artists were called as witnesses to present their cases. These artists have been working alongside the peasantry and working class people where development initiatives have been implemented. 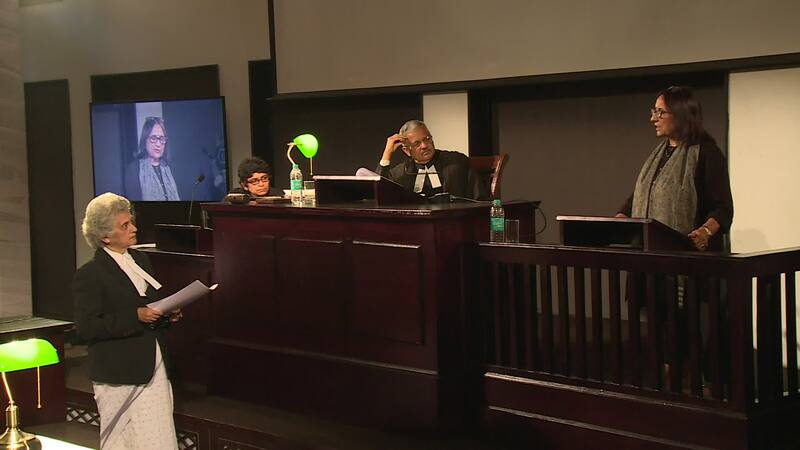 The witnesses were Ravi Agarwal, Navjot Altaf, and Sheba Chhachhi. Ravi Agarwal presented his evidence, a clip about farmers harvesting marigold flowers which are grown along the Yamuna. He says that the ecological dynamic existing there is sustainable judging from the nature of the effluents and the livelihood that it can sustain for the farmers. Although the real estate value of the land is high, he said that agriculture must be preserved because any development initiative might destroy the ecology. When asked if he was against the inclusion of technology in agriculture, he stated that it must be for the benefit of the people and within the permissible limits of the environment. He stated that the rehabilitation process is almost always half-hearted, being dictated by cost-benefits analysis. Navjot Altaf is an artist who worked with Adivasis and other indigenous artists. She showed a clip from one of her documentaries about adivasis of chattisgarh. The clip depicted a montage of various cultural elements of the indigenous peoples and their relation to the immediate environment. Her work reflects the immediacy of the people and their environment, especially with regard to the ill-effects of development initiatives that do not account for their cultural values and beliefs. She advocates for non-invasive development which will be sustainable in the long run. Mentioning the relationship between development and profit, she questioned how the former will actually benefit the indigenous people. Of course, again raising the concern of cost-benefits within which most development initiatives are construed. Sheba Chhachhi is based in Delhi. She has been analysing the state of the rivers in Delhi. Of particular interest has been the changing state of the Yamuna river. She presented her work which showed the suburbs and urban spaces of Delhi. The more disturbing part of her art was that the decrepit images were actually projected on to the neck of a person standing on the stage. While the images flickered, the neck showed signs of difficulty in swallowing, as if to signify the sickening nature of the environment. After this, she was asked about the relevance of myths in today's' reality and whether artists can, through their work, intervene effectively in matters of law and justice. She stated that as an artist, her stances are partisan at best, and that the application of art to today's reality is pertinent, especially so since they raise crucial questions which would otherwise have remained hidden. After the performance, when asked about the need for such initiatives, Norma Alvares, one of the lawyers in the mock trial, said that it was important because it could bring out perspectives that otherwise would have remained hidden in conventional court hearings. She said that the “whole purpose is to see that you don’t only stick to mathematical formula, expert reports, things which comes from geologists or biologists, but you also see a human side of the problem. Which if you cannot quantify it, at least consider it as human”. Read the Report on Landscape as Evidence.